I still get a rush from jogging a ream of printed brochures, freshly off the printing press. It’s the same kind of rush your customer gets when she feels the rich texture of that paper between her fingertips. When you’re designing for print, remember that the reader’s experience is tactile as well as visual. That’s why printing is unique and powerful. So choose your paper wisely, and you’ll communicate the benefits of your small business more powerfully. And that’s not to mention the potential savings in postage rates you get by making the right choice. Paper selection is becoming a lost art. So much is printed on standard or “house” sheets, these days. That may save a bit of cost, but it also has that “me too” kind of impact on the user. Come into our Rancho Cucamonga offices and you’ll find hundreds of paper swatches; it’s a feast for your fingers! I’ve had the good fortune of growing up when printing was “real.” It meant real lead type, machine stamped ink into paper. The blood, sweat and tears that went into building every page somehow made each page more believable, more real. “Letterpress” printing died out in the late 60s, though today it is coming back in a big way. A year ago I saw letterpress printed holiday cards at Target, of all places. Boutique print shops are appearing across the country, as users of print grow to appreciate a look and feel that just can’t be duplicated on an inkjet printer, copier or even a commercial offset printing press. Graphic designers and marketers are catching the real printing bug too. Like Indiana based Tactic Marketing who created this up to date take using classic technology. Look closely and you’ll see that “stamped in” text, even in this small photo. 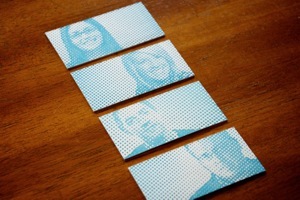 This business card face features a traditional layout, though the back side plays on a halftone dot effect that features company staff in a striking and memorable way. Sure, it’s possible to print business cards cheaper than this. Then again, who cares about ordinary looking, plastic-y feeling cards, when you want to position your brand in an extraordinary way? Yes, the internet has opened up printed products to price competition. Low prices tempt us into purchasing mass manufactured products that fit into standardized pre-press workflows and manufacturing processes. It makes for a sea of uniformity. Cheap, ordinary looking printing may be sending the wrong message to your fans and customers. On the other hand, your communication in print can reflect the unique talents, skills and approach you bring to your business or art. Can that be done on a simple business card? Absolutely, yes! But it won’t happen by accident. It’s rare to find recycled paper that’s truly good for the environment. Many recycled products contain only a small portion of recycled fiber. Others use harsh chemicals to restore their whiteness before sale. Beyond the recycled content, some sheets are produced using damaging, unsustainable forestry practices. The good news is that we’ve found a sheet that is 100% recycled, and is produced using only earth-friendly, sustainable practices. We’re only able to obtain it in large sheets, so it needs to be cut to size before use in most cases. That’s just what we do. We’re making the sheet is available to you in most printed products, as well as unprinted for general office use. Drop us a note for a sample. Now, what you’ve been waiting for: In this short feature film, you can see a Copies&Ink employee (who shall remain unnamed) converting large sheets of Conservation® text into practical, usable sizes. And yes, the film is an unprecedented behind the scenes look in the bowels of a modern printing operation. Enjoy The Guillotine: A Behind the Scenes Look at Life in a Print Shop. Why in the world do you want a logo? In this 5 minute video designer John McWade says it well. It’s far too easy to get deep into a logo project without really understanding the reason for starting. “I have a business, so I need a logo,” doesn’t really provide the clarity and direction that is needed to produce a winning result. Beyond that, it’s time for an honesty check. An ideal logo designer needs to be an insightful marketer, a skilled production artist and also posses great visual acuity. If you or your team is missing just one of those pieces, looking for the perfect logo may lead you down a long and winding road. It really comes down to the person. An online logo design company with a 200 page catalog may look impressive, but will you end up working with a person who will take the time to understand your business at a deep level? On the other hand, if your story is easy to tell, you might run into a art student at a junior college who is perfect for the project. Over the years, I’ve had the pleasure of meeting and/or teaching such students here in Rancho Cucamonga. Some now work at high ticket ad agencies. There are many dead end streets on the logo journey. Get some good directions, and never settle for a sub par result. No logo is usually better than a poor logo. In fact, a simple typographic-only treatment may be just the ticket until you’re ready for a full blown logo design.